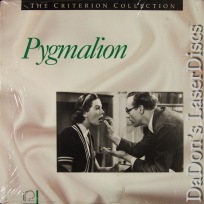 Pygmalion 1938 - 90 min. - Black and White Genre: Comedy Not Rated Country: USA LaserDisc Movie Review: George Bernard Shaw's play, PYGMALION, which takes its title from the Greek myth of Pygmalion, a sculptor who fell in love with a statue of his own making, was a hit on the London stage in 1912. The transition to film was co-directed by Anthony Asquith and Leslie Howard, who also stars as Henry... Thanks for Visiting DaDon's Rare LaserDiscs ! Reviews, Articles, Newsletter and Information for Movies on LaserDisc LD Laser Disc, LazerDisc.